Large lakes during the Eocene Epoch, 50 million years ago. This article is the second in a series of articles planned to highlight exceptional examples of the diverse geologic cores available at the Utah Geological Survey’s (UGS) Utah Core Research Center (UCRC) (see Survey Notes, vol. 46, no. 3). As well as being used for research purposes, these cores, obtained through UGS projects and generous industry donations, are used for teaching geology students and training industry professionals, particularly those who search for oil and gas. Utah is fortunate in that many of the same rocks captured in subsurface cores housed in the UCRC collection are exposed in canyons, mountains, and plateaus throughout the state. Thus, geology groups and researchers often head to the field to get a broader view of the same rocks they examine at the UCRC. To assist, the UGS offers core workshops and associated field trips, using cores that showcase classic examples of Utah geology to enlighten bright young minds and train the working professional. The Skyline 16 Green River Formation lacustrine (lake) core is one of the most popular training resources at the UCRC. The beautiful high desert landscape of the Uinta Basin looked very different 50 million years ago, during the Eocene Epoch. Imagine a landscape similar to present-day Great Salt Lake, but with a much larger lake, one that at times filled the entire Uinta Basin in Utah, as well as the Piceance Basin in western Colorado. The evidence for this large Eocene lake, named Lake Uinta, as well as a similar lake in Wyoming named Lake Gosiute, is recorded in the sediments of the Green River Formation. Utah’s much-talked-about oil shale resources, as well as significant conventional oil and gas reserves, are found within the strata that accumulated in ancient Lake Uinta. Additionally, recently discovered, massive, deep-water offshore Brazil (pre-salt) oil accumulations are interpreted to be in Lower Cretaceous lacustrine carbonates, including possible microbialites. Similar deep-water carbonate reservoirs have also been found off the west coast of Africa. To better understand these new discoveries, as well as other lacustrine oil reservoirs worldwide, geologic researchers have sought out well-known examples of lacustrine rocks, such as the Green River Formation. In May 2010, the UGS and the University of Utah’s Institute for Clean and Secure Energy teamed up to recover 1000 feet of continuous 4-inch-diameter core from the middle to upper Green River Formation, about 60 miles southeast of Vernal in Uintah County. The core was subsequently slabbed lengthwise, taking care to provide an excellent, unobscured viewing surface. 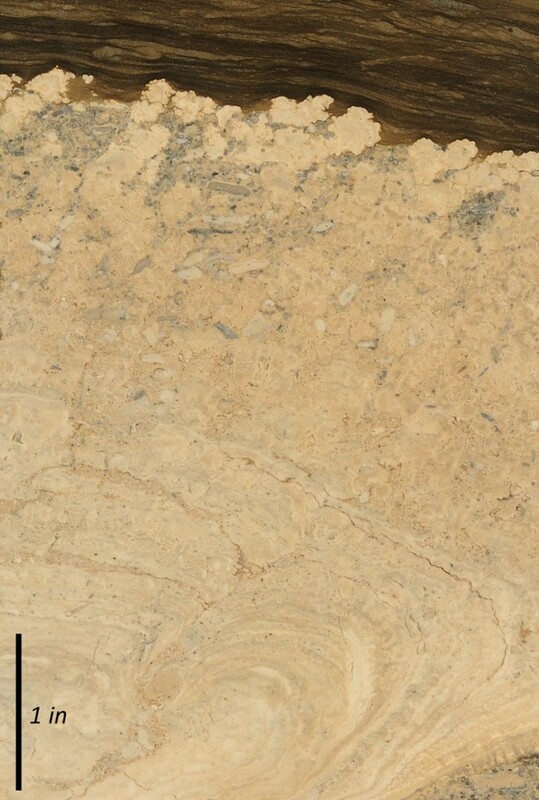 Additionally, the largerthan- typical core diameter allowed for an unusually large “slab” surface that exhibits many of the core’s excellent lacustrine features. The lower part of the core captured lithified sediments that were deposited near the shore of the ancient lake. Lake levels fluctuated significantly at this time, creating rapid changes in rock types, or facies, preserved in the core. Similar to Great Salt Lake, the nearshore part of Lake Uinta in eastern Utah was probably very flat and broad, meaning a small change in lake water elevation would greatly affect the lake’s overall size and facies distribution. The fluctuations are recorded as roughly 3-foot, shallowing-upward cycles. 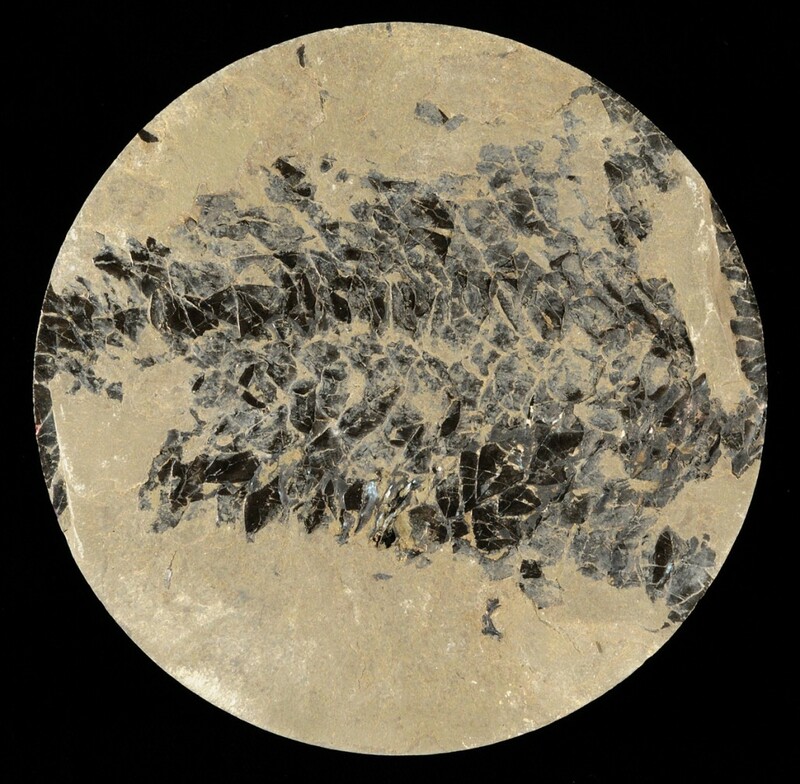 Often, the part of each cycle representing the shallowest water contains beautifully preserved microbialites including stromatolites, thrombolites, and associated carbonate grains (ooids, pisoids, and oncolites). 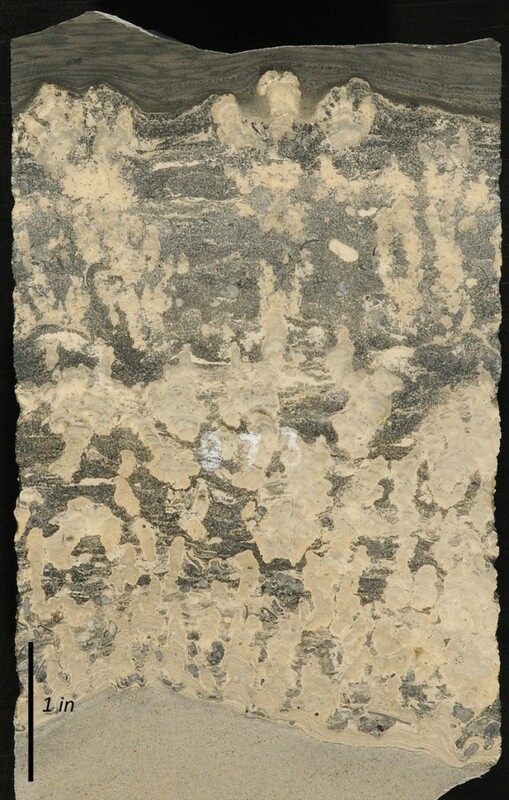 The extent and characteristics of the microbialite facies within the Green River Formation is particularly important as these rocks have some of the best petroleum reservoir qualities. Moving stratigraphically higher in the core, the rocks record a gradual transition from nearshore, shallow water (littoral to sub-littoral) to offshore, much deeper water (profundal), and therefore a much larger lake. At a depth of about 460 feet, the core preserves the Mahogany bed. The sediments in this bed contain almost 40 percent preserved organic material, the highest found in the core. This interval of core is interpreted as preserving the lake’s highest level and largest aerial extent. This zone is also prized for containing the largest oil shale resource in the state of Utah. Following Mahogany-zone time, the lake began to shrink, eventually retreating to a point where it became restricted and hypersaline. At this time, saline minerals began to precipitate in the lake’s bottom sediments and are now preserved in the core. This transformation is somewhat similar to how Pleistocene Lake Bonneville retreated and shrunk into present-day, hypersaline Great Salt Lake. The Skyline 16 core provides an excellent teaching tool for researchers interested in lacustrine strata and reservoir systems. The entire range of lacustrine environments are preserved and excellently displayed in this core, from deep-lake, laminated, organic-rich oil shales, to shallow-water microbialites and associated carbonate grainstones, to fluvial, deltaic, and mouth-bar siliciclastics, to evaporite deposits. For the full lacustrine experience, UGS geologists can also arrange a trip to Great Salt Lake, which serves as an excellent modern analogue to features preserved in the core, or a trip to the world-class Green River Formation outcrops in the southeastern Uinta Basin. To see the Skyline 16 Green River Formation core or schedule a workshop/field trip, contact Michael Vanden Berg, Petroleum Section Manager (801-538-5419, michaelvandenberg@utah.gov) or Peter Nielsen, UCRC Curator (801-537-3359, peternielsen@utah.gov).